I've seen a couple blogs talking about wages versus inflation. Theres a concern lately that wages aren't keeping up with inflation. Personally every individuals wages and expenses take different paths so what matters to you is your own wage history and your own spending. Looking at national averages really only gives a very abstract situation. Still you don't want the national situation to be negative in general. 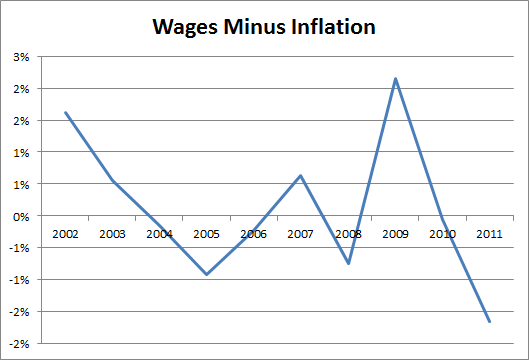 I got data on wages and inflation from the BLS. 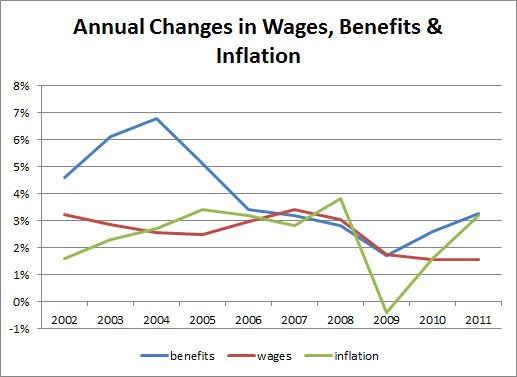 The cost of wages and the cost of benefits are different for employers. Employees usually only really look at or even see the wages portion. You know your hourly pay or salary. However most employees also get substantial compensation via benefits which our employers pay for. The cost of the benefits to employers may include reduction in benefits, so the % cost here isn't too useful from the employee perspective. If you add up the cumulative changes from 2002 to 2011 then wages went up about 28.5% on average and inflation went up about 26.9%. The total for the latest 3 years shown isn't as great from 2008 to 2011 wages were up 8.1% but inflation rose 8.4%. So we lost a little ground in the latest 3 years. Of course these numbers don't mean much to an individual who may or may not have gotten a wage increase. Also the numbers don't really say what the "average raise" was but instead show the average in wages paid. Theres a difference there. A 3% increase in wages doesn't mean people got 3% raises, but that total wage spending was up 3%.